Lostentry - Welztalbahn, Model Railroading, and more: 4 story houses in Emsingen ... or not. 4 story houses in Emsingen ... or not. I'm currently building more houses for the town of Emsingen. One of the kits I got for this a while ago is Faller's 130436 half-relief, background houses. I like the idea of half-relief houses since one doesn't need as much space as for the complete house, while still giving the impression of "there's more". These two houses are the 4-story variant. The kit was an impulse buy, and I didn't really consider how high 4 stories is, nor the feel of Emsingen town. As time progressed and first houses were set on the layout, I took another look at that kit and mused that 4 stories is quite high. When I started building the kit I kind of spaced on this earlier insight. After the ground floor was built and I placed the house on the layout, it felt like a sky scraper, and completely out of place. Some kit-bashing was in order. 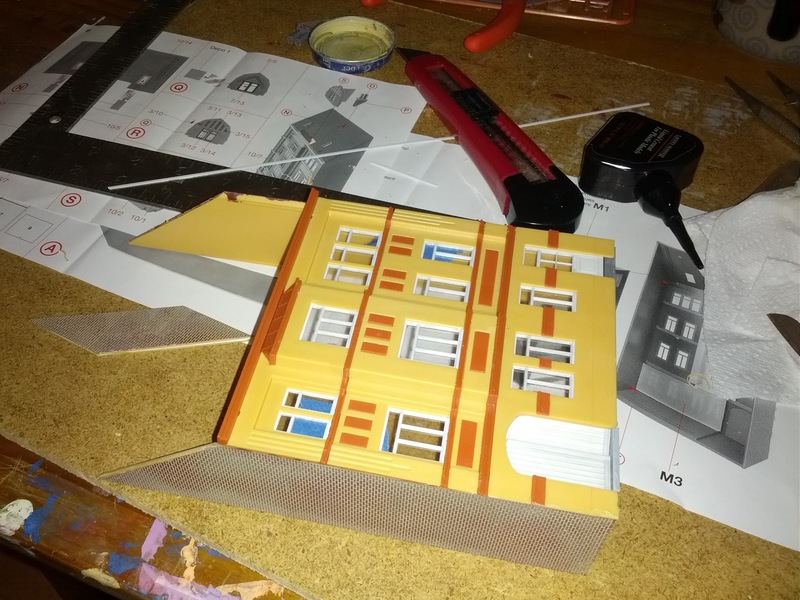 Of course, by now I already had glued together the ground floor, so I couldn't go the easy route and do a nice straight cut along the bottom of the side-walls, instead I needed to cut at the roof line. In the photo below I already shortened one of the two side-walls, and am test-fitting the facade, while the wall in the rear is still the original height. Yep, that works much better. Just imagine there were another floor in that house. It would be almost as high as the church steeple.